We construct an action for NSNS 5-branes which is manifestly covariant under O(d, d). This is done by doubling d of the spacetime coordinates which appear in the worldvolume action. By formulating the DBI part of the action in a manner similar to a “gauged sigma model”, only half the doubled coordinates genuinely appear. Our approach allows one to describe the full T-duality orbit of the IIB NS5 brane, the IIA KKM and their exotic relations in one formalism. Furthermore, by using ideas from double field theory, our action can be said to describe various aspects of non-geometric five-branes. I. Jeon, K. Lee and J.-H. Park, Supersymmetric Double Field Theory: Stringy Reformulation of Supergravity, Phys. Rev. D 85 (2012) 081501 [Erratum ibid. D 86 (2012) 089903] [arXiv:1112.0069] [INSPIRE]. I. Bakhmatov, D. Berman, A. Kleinschmidt, E. Musaev and R. Otsuki, Exotic branes in Exceptional Field Theory: the SL(5) duality group, arXiv:1710.09740 [INSPIRE]. 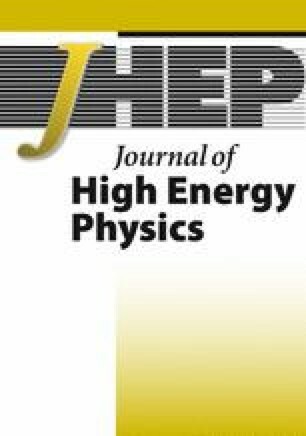 E. Bergshoeff, B. Janssen and T. Ortín, Kaluza-Klein monopoles and gauged σ-models, Phys. Lett. B 410 (1997) 131 [hep-th/9706117] [INSPIRE]. E. Bergshoeff, Y. Lozano and T. Ortín, Massive branes, Nucl. Phys. B 518 (1998) 363 [hep-th/9712115] [INSPIRE]. E.A. Bergshoeff, T. Ortín and F. Riccioni, Defect Branes, Nucl. Phys. B 856 (2012) 210 [arXiv:1109.4484] [INSPIRE]. D. Andriot and A. Betz, β-supergravity: a ten-dimensional theory with non-geometric fluxes and its geometric framework, JHEP 12 (2013) 083 [arXiv:1306.4381] [INSPIRE].